Sometimes you wake up in the morning and your face looks like an arse. Other times you are Crackpot. Crackpot joins the list of Rock Lords with astonishingly baffling faces: no matter what else, Crackpot is the guy with a head made from a hot cross bun. Yes, there's more to him than his face but that is what will be haunting you at night. Is the purple cross on his face his giant mouth? It looks like it, but that's a huge mouth! There's something about the design that looks really alien and crosses over from weird into cool. The spherical face also reflects his rock mode, and well... look at it. Man. This guy. 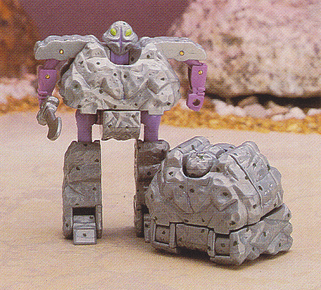 Rather than having a mottled plastic like many Rock Lords, Crackpot is a plain silver. It's a good silver though, not grey like many other figures that claim to be silver. It also works well with his lilac limbs. These don't photograph too well - they're actually the same shade, however his thighs are die-cast and so look darker in pictures. Crackpot has pleasingly chunky legs and some huge shoulder pads to remind you that this was the 80s. He does come across as looking extremely chubby though, as most of his rock mode makes up his upper body. It helps to sell the idea of a walking rock creature, but a slightly thinner frame would have looked more 'cool'. Crackpot wasn't always designed to be so flat. Prototypes images show alternate designs where he gets a more mottled paintjob to make him look more cratered, and a straight-up meteorite deco. To be fair these do look more interesting than his final look, which can feel a bit flat. Below the waist, Crackpot has amazing articulation. He has a waist twist, hips that swivel outwards and back and forth and proper knees that bend the correct way! His feet even move. Above the waist, his arms flap from side to side. It's a stark contrast in design terms: the limited arms wouldn't be as much of an issue if the rest of him wasn't so articulated. Even so, he's far above the capabilities of most other toy lines from that era. Crackpot transforms in much the same way as Tombstone. The legs and head tuck in, and the arms fold in to holes in the side, the shoulder pads covering the gaps. It's a bit strange that his transformation doesn't include a waist twist given that he has that articulation, but it was just another example of added movement. 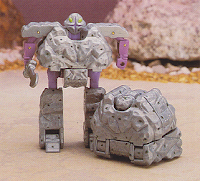 Despite the transformation being similar to Tombstone's, the rock mode is very different, being quite short and bulky. As a rock it isn't that successful. It's very obvious where the head and legs are, as there is no attempt to cover them up - perhaps understandable given the spherical head but less so for the bulky legs! The rock surface has a lot of small nicks in it which is nice detailing, but it feels as if it is a bit too subtle to appreciate. Crackpot is the epitome of an average Rock Lord. He's got some really good points such as his bizarre face, cool looking design and silver colouring, but at the same time his rock mode is poor and his arm articulation is really lacking in comparison to the rest of him. Aw, I love Crackpot. I think he was my favorite, character-wise, as a kid.